I wanted measure how fast my sonic toothbrush actually brushes, so I used a sound recorder to measure the sound it makes! I then looked at the waveform that the computer can show up to show how many oscillations per second. I counted 25 per tenth of a second, which is only 15,000 cycles per minute. But they claim on the packaging that it’s 30,000! Ben: I’m not really sure I know this is the best way to measure it. If anybody knows get in touch: Chris what do you think? Chris: I think you may be on to something. When I was driving around in Australia last year a group of school children tried to measure vitamin C in foodstuffs as their school science project. They took an off-the-shelf substance, food or drink cordial which is a well known, very powerful brand, full of vitamin C. So they thought, "we’ll use that as the control because we know that will have lots of vitamin C and if we can detect that we know our experiment’s working." They kept getting a negative result. It turned out that the company were lying and saying it was full of vitamin C and there was none in it. They had to pay a very big fine and change all their labelling. 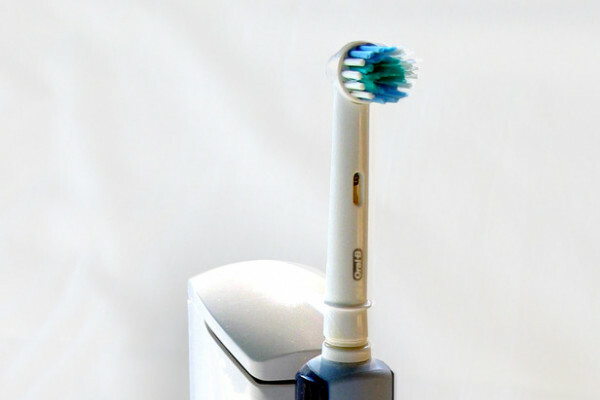 It could be that with this sonic toothbrush there’s a little bit of adventurous advertising going on. I think if anyone else has a sonic toothbrush and they would like to record it, analyse the waveform. If in fact you’ve done this, please do experiment and then tell us how many cycles a second is it producing? Is there some misleading advertising going on? Ben: It would be fascinating to find out and we’re really pleased, Mark, that you’re getting into Kitchen Science in this way. So what do you think? Is this a good way to find out how fast a sonic toothbrush vibrates? Previous What is the white stuff in zits? Next Vocal Accent While Singing? Does a mint make your mouth cold? Can you get Drunk through your Feet?